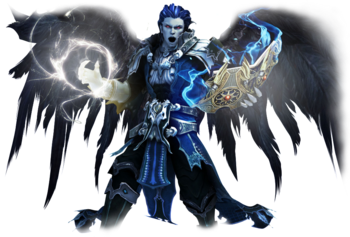 The Sorcerer is the Crowd Control (CC) specialist of Aion and also a fearsome dps class with the hardest hitting spells in the game. Sorcerers use their powerful CC abilities to control the flow of a fight while also casting devastatingly powerful spells to dispatch their targets quickly. This class is primarily a DPS class with excellent CC capability. The sorcerer is the main CC class in Aion as no other class has access to such a wide variety of ways to temporarily remove targets from a battle. This alone makes the sorcerer a worthy asset to any team as they can simply CC any major threats to their party, while their party focuses on the task at hand. While a sorcerer can easily CC multiple targets, they also have access to a few AoE CC skills as well, which can easily save their party from disaster or ensure the victory of their group. In addition to this excellent utility value, sorcerers have access to the hardest hitting, direct damage skills in the game and are known to easily dispatch a target in both PvE and PvP with one or two spells. For armaments, sorcerers, like spiritmasters, are limited to choosing either a tome or an orb to wield while on the battlefield. While orbs provide more magic boost, increasing magical damage done, tomes provide a higher degree of magical accuracy, which reduces the chance that a spell will be resisted by the target. While at lower levels the difference between the two weapons are negligible, in the endgame, most sorcerers exclusively wield tomes to ensure that their powerful spells always hit their mark. In solo PvE, sorcerers simply raze through anything set in their path. With powerful spells, such as Inferno, at their fingertips, sorcerers rarely spend much time actually taking down a target. However, should things go badly for sorcerers, they can simply use any of the many snares or CC’s at their disposal to instantly make a fight more favorable for them. In group PvE, sorcerers are often sought after for their ability to make any battle go more smoothly. As most, if not all, instances feature grouping of multiple elite mobs, sorcerers can simply CC one or more of them while aiding their party in focusing down the main target. This helps to relieve pressure on both the healer and tank in their group making for a much smoother run. Also, as some instances and areas of Aion feature mobs that are more susceptible to magical attacks, sorcerers are sought after to finish runs in these areas quickly and efficiently. In solo PvP, sorcerers are infamous for their ability to instantly incapacitate their targets with a single spell. If by some chance, their targets actually manage to survive their first few spells, sorcerers can simply snare or CC their targets indefinitely or continue their barrage of high damage spells. Sorcerers are also equipped with many utility skills that can keep them alive even through their weak armor. In addition to the shielding Stone Skin spell available to both mage classes, sorcerers also have access to Blind Leap, which enables them to instantly put distance between their target while removing any snares or movement restrictions that have been placed on them. At higher levels, they also have access to Illusion, which allows them to evade physical attacks. In group PvP, sorcerers provide the heavy spiking ability to quickly dispatch the designated targets of their party. Their CC ability can also be used to great effect on enemy healers or plate classes by ensuring that their party’s focus targets cannot be healed during a spike or by ensuring that the enemy plate classes can effectively be ignored. If a group is well organized, a sorcerer can cast AoE CC’s to instantly incapacitate an enemy group and thus allowing their party to quickly and painlessly take down their enemies one at a time.. In summary, the sorcerer is an excellent DPS class with amazing CC capabilities. While sorcerers can be fairly straightforward and easy to play in PvE, their low HP pool and fragile armor ultimately makes for a soft target in PvP. Even with their Robe type buffs, Stone Skin, and instant escape skills, sorcerers do not mitigate damage well and can be taken down quickly if not played skillfully or if caught by surprise. Proper timing on spell rotations, excellent spacing, and excellent use of CC’s, snares, and silence are required to excel in PvP settings. One thing to note is that even with the highest mana pool in the game, sorcerers burn through mana very quickly as their mana management skills are subpar. As sorcerers cannot do any significant damage without the use of mana, they are left to either choose between sitting to regen mana or using mana potions very frequently. PvP armor sets usually add Magical Accuracy manastones. PvE armor sets usually add Magic Boost manastones.